This movie moves around the life of a father and a son in the aftermath of the nuclear catastrophe. The movie reveals the various environmental disturbances caused by the nuclear war faced by them as it goes. 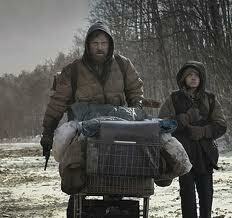 The father and son moves from their own place in search of a warmer place to live as the ended war had made their place so cold. In their journey they take an old man with them. They were attacked by cannibals and the old man died but they escape with father having serious injury. In few days the father dies. The film ends as the child is taken by another family. The movie reveals about the situation if there is a nuclear war.This shows how a man made invention can affect the environment. Every country holds enough nuclear weapons to destroy their own country. It is said that with weapons in USA and Russia, the entire world can be destroyed 15 times. So there is a need for regulation of these nuclear weapons in all countries by the United Nations.